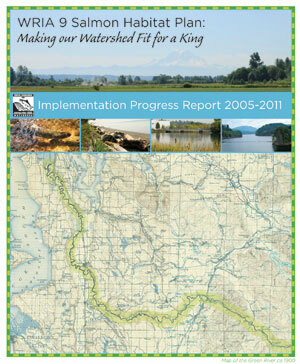 The Implementation Progress Report provides a snapshot of the accomplishments the Green/Duwamish and Central Puget Sound Watershed (WRIA 9) has made over the past six years to implement the WRIA 9 Salmon Habitat Plan. Considering the funding challenges and other barriers faced over the years in getting habitat projects and programs on the ground, the Implementation Progress Report demonstrates positive and significant steps forward, and the strength and importance of partnerships. The Watershed Ecosystem Forum has secured over $36,500,000 in WRIA 9-directed funding since Salmon Habitat Plan adoption in 2005. The funding went toward key projects and programs in the most important locations of the watershed to recover the Green River Chinook salmon population. While the Implementation Progress Report shows progress made and reason to celebrate, it also reinvigorates a call to action. The number of natural origin spawners in 2009 was only 207 fish, the lowest count since 1981. This unprecedented low number of salmon is a sign that not all is well and more needs to be done. The Implementation Progress Report is available in Adobe Acrobat (.pdf) format.